Bob’s Yer Uncle is on a temporary performance hiatus while Adrian frolics around Paris. We will, however, continue to produce new music, so keep an eye & ear here & on Facebook for announcements and news. Some new songs will be posted on our Songs Page. March, 2016 We’re excited to announce Bob’s Yer Uncle will be playing the world famous Cavern Club in Liverpool, England in May. On Friday night May 20, we’ll be at the Cavern Pub at 7:15PM and on Saturday afternoon, May 21, we’ll be at The Cavern Club at 12:15PM. Info here. 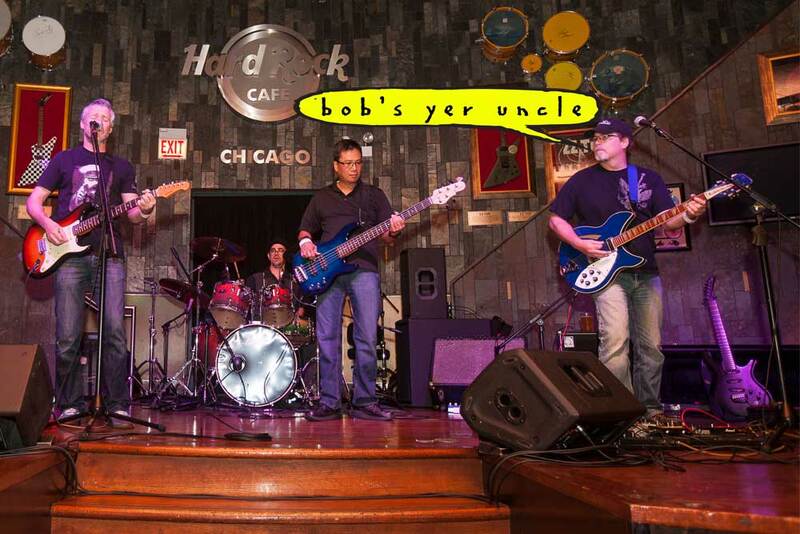 March, 2016 Once again Bob’s Yer Uncle will be appearing at The International Pop Overthrow Festival at The Redline Tap in Chicago on April 23, 2016. Showtime: 9:00PM. Info here. December, 2015 In the studio recording a new tune. May, 2014 Finished mixing Breathless. This song will appear on a compilation CD for The International Pop Overthrow Festival. 8:45PM Appearing at The Red Line Tap for The International Pop Overthrow Music Festival..
May, 2013 Currently in the studio putting the finishing touches on the song “Breathless”. Next up, “Sleepwalking” and “Addiction”. December 1, 2012 Whisky Rainclouds from X-Plod-I-Mite has been chosen as part of the RickResource Forum CD Vol. 4 compilation. It can be purchased here. This is the 2nd BYU tune to be chosen for a RickResource Forum CD, the first being Vol. 1. March 17, 2012 Songs and songbites from Xplod-i-mite are now posted here in the Audo section of the site. Purchase the CD here now. March 14, 2012 The new Bob’s Yer Uncle CD, Xplod-i-mite, is out later this week. It will be available here on our Website along with the first CD, “Innocence and Experience”, for $11.99 each including shipping. Credit cards and PayPal accepted. More details to be released shortly. Return often. X Plōd I Mite was recorded at several locations including MoFlo Studio, Chicago Trax & Alias Smith Studio. Also, remote locations were utilized to take advantage of things like a real Hammond B3 & Leslie (thanks to Tony LaBrasca). The album was engineered by Bill & Phil for the most part and mixed by Chuck Kawal. Additional editing was performed by Phil, assisted by Bill & several various Single Malt Scotches. Production is shared by Chuck and all of BYU. 3 tracks were mastered at Colossal Mastering by Dan Stout with the remaining 7 to be done by Jason at Chicago Mastering.Come back for more news often.